The negotiations between Hendrick and DEI over the use of the number 8 in NASCARSprint Cup for next year have concluded, with DEI keeping the number for 2008. Marshall Carlson, the General Manager of Hendrick Motorsport said “We’ve been working hard to secure the No 8 for Dale Jr’s car number next season. Obviously, he has a tremendous history with that number, and we know how important it is to his fans. Earnhardt’s grandfather Ralph raced the number 8 and Earnhardt Jr adopted the number, and has raced it in Nextel Cup since joining the series in 1999. He said after signing for Hendrick Motorsports that he would like to continue using it in his new team, but sadly for him that won’t be the case. 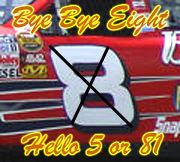 The news will be very disappointing for the many Earnhardt fans who proudly wear the No 8 in just about anything, and also to merchandise businesses which will probably have to put all their No 8 items on sale. “I’d like to take it and use it the rest of my career. I’ll give it back when I retire but I’d just like to run the No 8 the rest of my career,” Earnhardt said at Indy two weeks ago. The No 81 is said to be considered among the likely options for Earnhardt for the 2008 season and beyond.